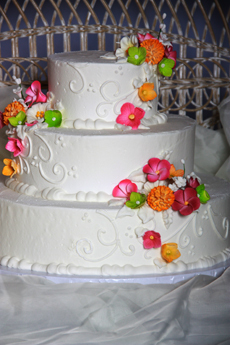 At Emily's, we will work closely with you to create the look you want in a wedding cake . . . and to stay within your budget. 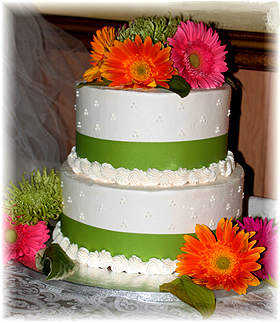 Wedding cakes are baked fresh and are decorated by our professional decorator. We use buttercream icing for a cake that not only looks beautiful but is delicious to eat! Prices include delivery and set-up in the Hastings area. Delivery to limited areas outside Hastings is available for a fee. 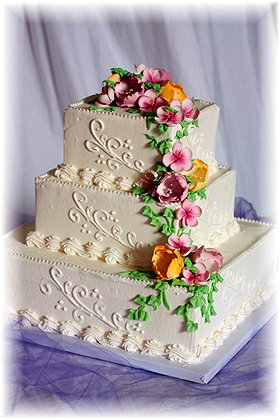 Wedding cake flavors include: white, chocolate, marble, carrot, red velvet, lemon, almond, lemon poppyseed or almond poppyseed. Fillings include buttercream, lemon, raspberry, cherry, stawberry or custard. Prices are based on the number of servings needed. For a tiered, decorated wedding cake, the prices range from $2.29 to $3.19 per serving, depending on the flavor of cake and the decorating style chosen. Sheet cake prices are listed below. Many couples with large numbers to feed chose a smaller tiered cake and then finish off with sheet cakes. 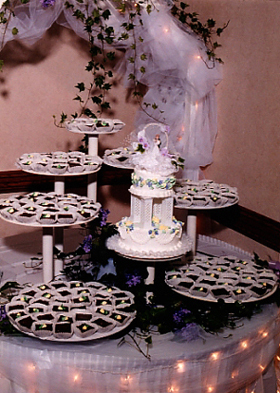 To create a unique look, we have several different cake stands, lighted fountains and heart- or hexagon-shaped cakes. We stock accessories, such as wedding cake top ornaments, unity candles, cake server sets and glassware. These items may also be special ordered through one of several companies. 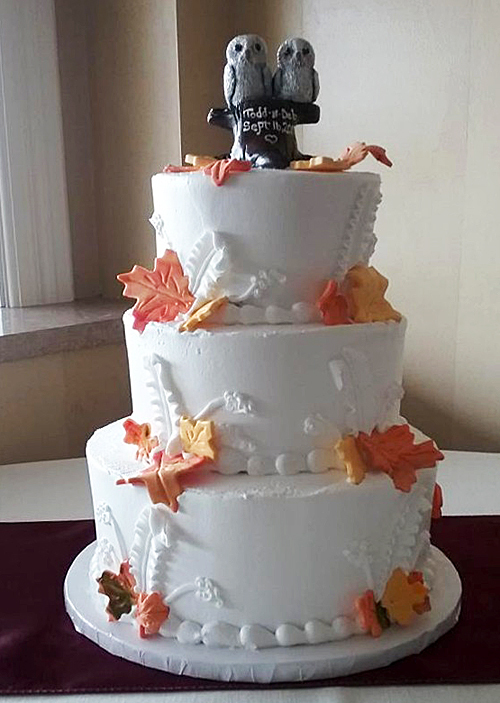 Once you have made the decision to let the experts at Emily's create your cake, it is best to call and reserve the day. 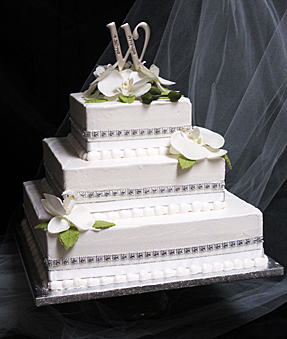 We do a limited number of wedding cakes each day, so it is best to book the date early. 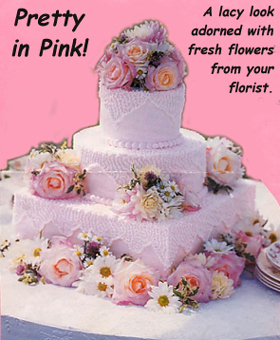 When you are ready to order your cake, please call ahead to set up an appointment with Norine or Renee. 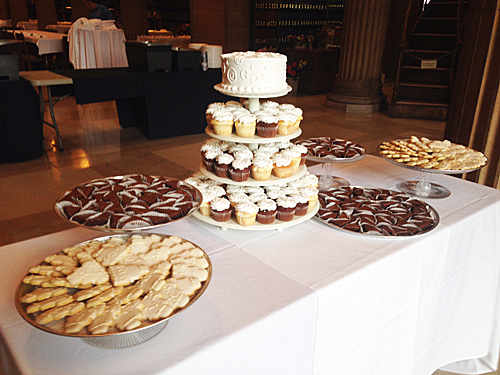 Our cascading stand is interchangeable from three to five tiers of cake. Each tier is a free-standing unit, making cutting very easy. 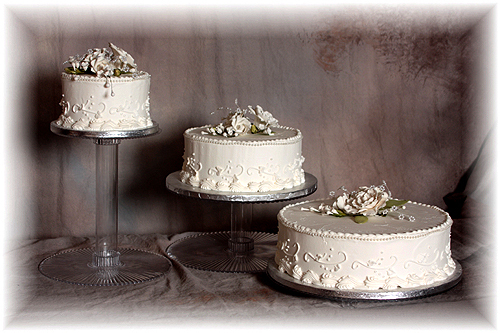 Below are some examples of Emily's wedding cakes. 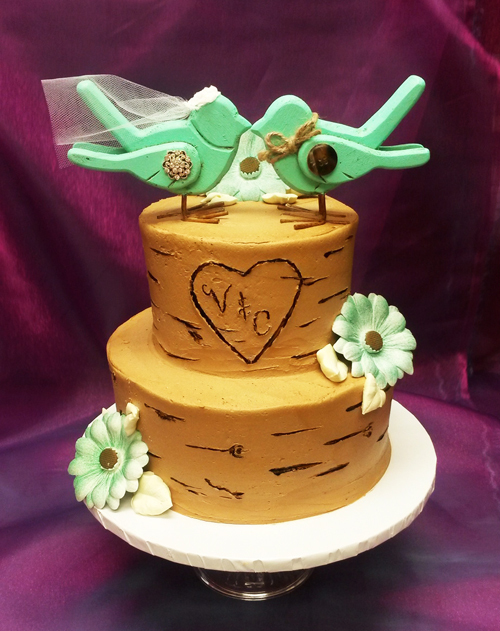 For more ideas, please stop in to our store and page through our wedding cake book. The possibilities are nearly limitless! 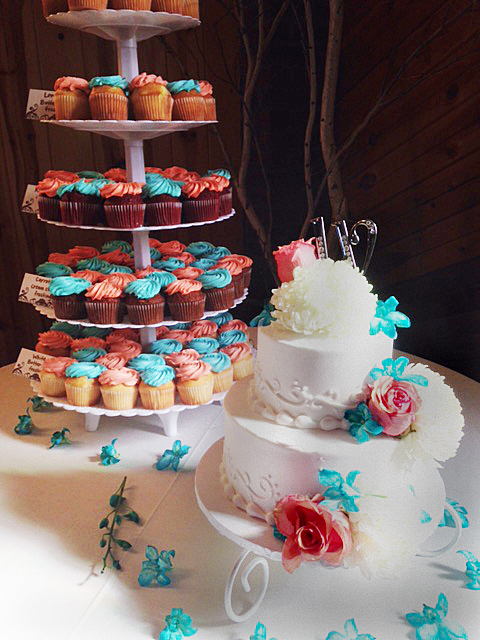 The cake ON THE RIGHT is a three-tiered cake with a scroll-dot design and assorted royal icing flowers. It serves 95. 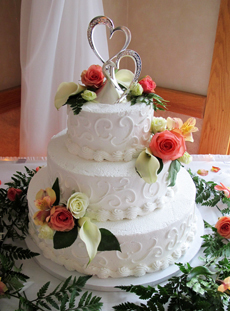 The cake ON THE LOWER RIGHT consists of three tiers with a scroll-work design and fresh flowers. It serves 125. 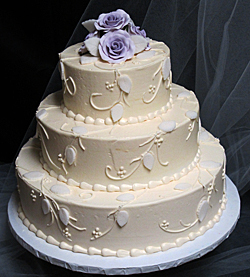 The cake BELOW is a Victorian charmer -- elegant with a lacy overlay. As shown, it serves 75. A contemporary design with rounded edges. 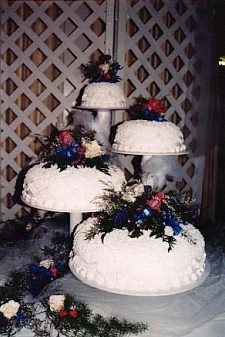 Four tiers of cake that appear to be covered with lace and flowers. As shown: serves 230. White on ivory in a simple, classic style. 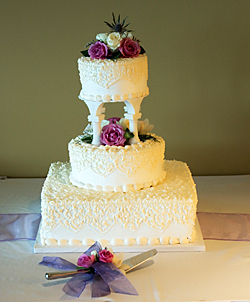 This three-tiered stacked cake, as shown above, serves 95. Looking for something a bit different? Serve your guests bars rather than cake. As the photo on the right shows, the bars can be artfully displayed on a cascading stand. ABOVE: Clean, white elegance! As shown, serves 175. ABOVE: This three tiered cake features old fashioned rosettes with a touch of vine work and some soft colored flowers. .
A three tiered cake with a natural design accented with gum paste succulents. 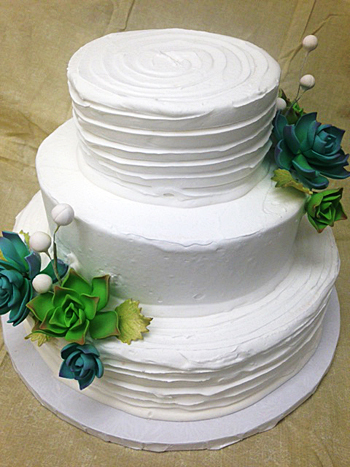 A simple three-tiered design in an off-white buttercream dressed up with fresh roses. A modern, bejeweled design . . . in three square tiers to serve 150. Match the floral display to your wedding bouquet. 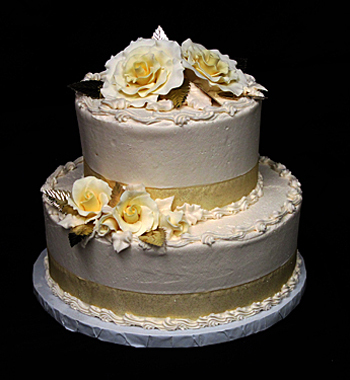 This small, two-tiered cake is accented with soft yellow roses and ribbon. It serves 34. An autumn design to serve 125. 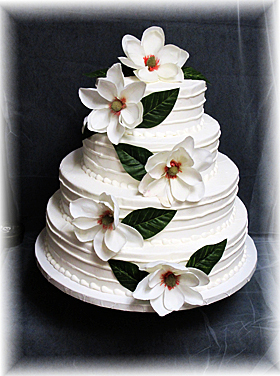 Beautiful fondant leaves with white accents adorn this three-tier cake. 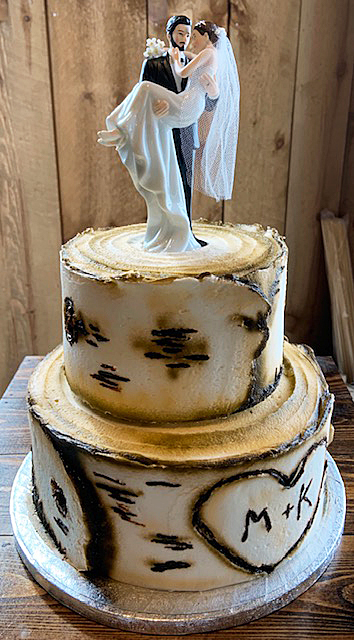 Looking for the perfect cake to fit your nature-themed wedding? This is one tree-bark option available at Emily's. A new trend involves couples using ribbon to replicate their wedding colors on their cake. The simple two-tiered cake, on the left below, serves 40. 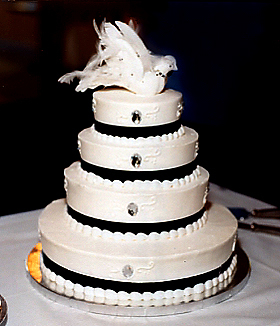 The four-tiered cake with black ribbon, on the right below, serves 150. The black ribbon and jewel decorations coordinate with the wedding couple's black color theme. 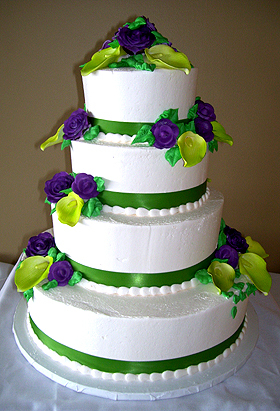 The four-tiered cake with green ribbon, above left, also serves 150 people. 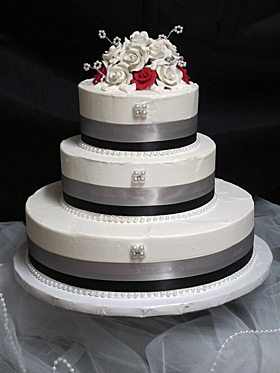 The cake on the right above features roses and pearls with a sleek double ribbon. It serves 85. 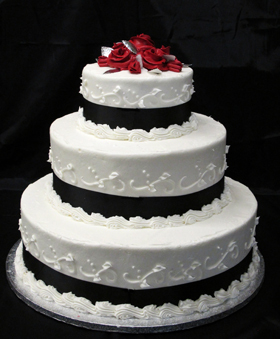 The three-tiered black ribbon cake with red frosted roses, on the left below, serves 125. 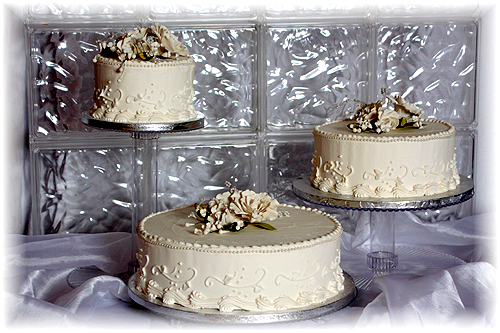 On the right below, a three tiered cake with a combination of smooth and textured side work. 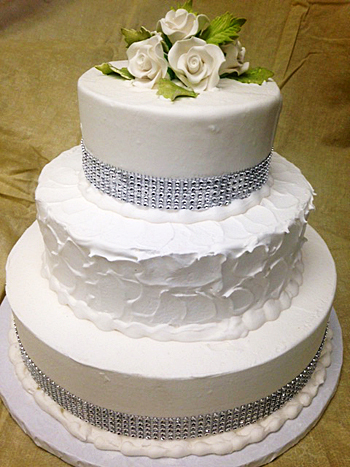 Add an artificial rhinestone ribbon to a couple tiers to dress it up! 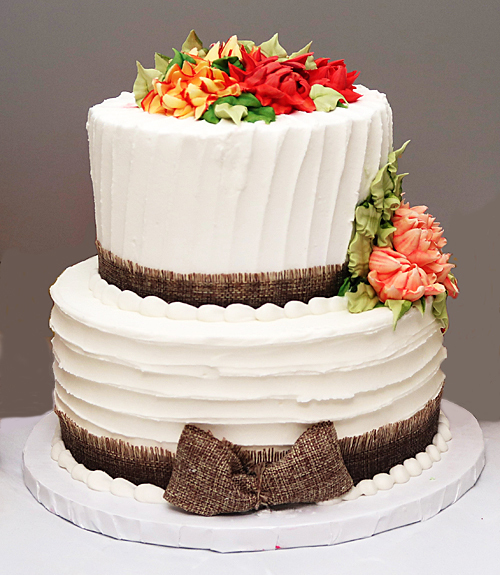 Popular burlap adorns this two tiered cake, pictured above, featuring royal icing fall flowers. As pictured, this cake serves 25. Tiers can be adjusted to serve more guests. Cupcakes or sheet cakes can be added on the side for additional servings. A few more creative possibilities! 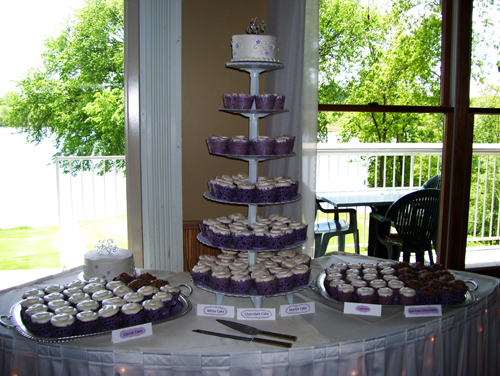 The three-tiered cake on the left below serves 95. 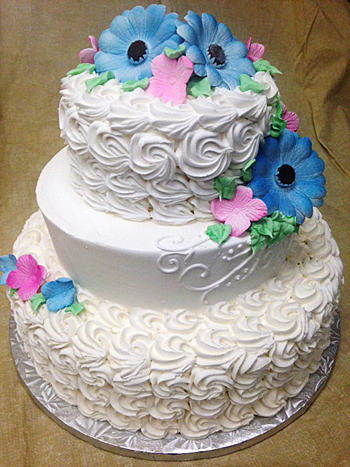 This cake features a cascade of handmade royal icing flowers with a textured base buttercream frosting. It tastes as good as it looks. The close-up photo on the right below shows our simple vine design topped with fresh flowers. 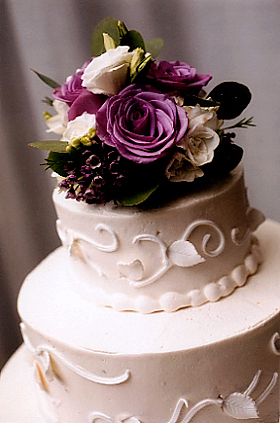 The combination makes an elegant wedding cake. Available in various sizes. 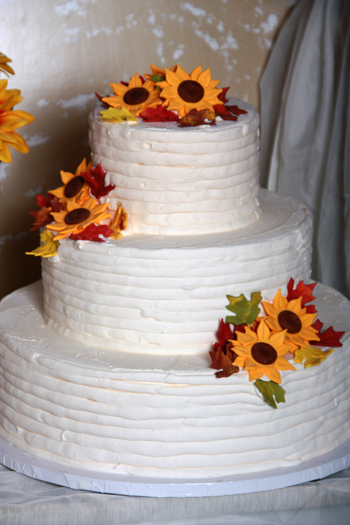 The cake on the bottom left consists of a natual style with sunflowers and colorful leaves. It serves 125. 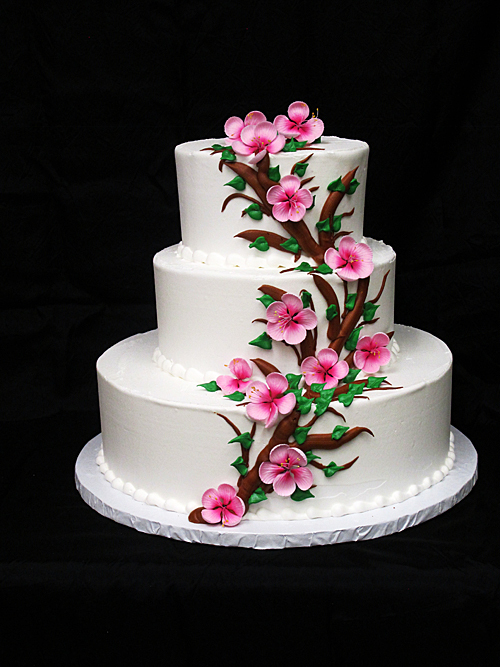 Adorned with apple blossoms, this cake serves 85. Great for a spring wedding. A simple way to serve your guests. Display options vary. Assorted flavors available. 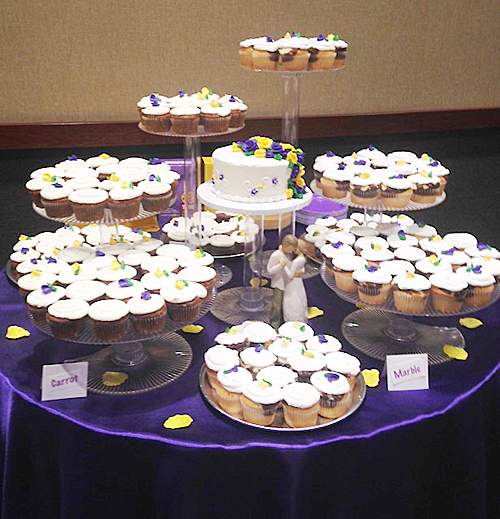 This couple chose purple and gold for their wedding color scheme and displayed their cupcakes on our clear cascading stand. They also used some silver trays to display additional cupcakes. A two-tiered elegant cake adorned with fresh flowers sitting on our white garden stand is the focal point on this wedding cake table. 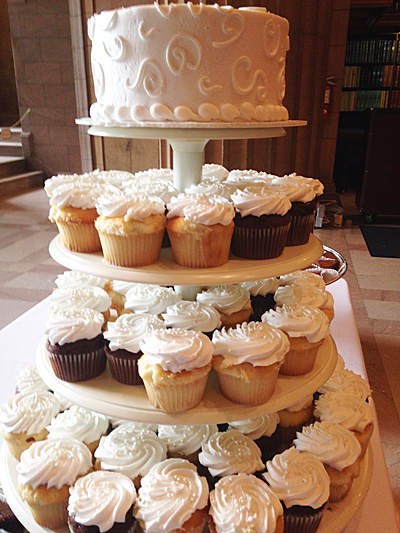 A tiered tower stand filled with cupcakes for the guests waits just behind the main cake. 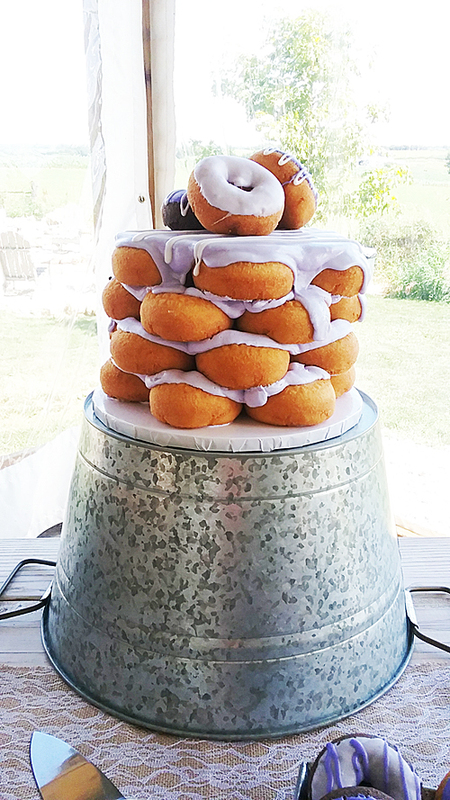 Four layers of plain cake donuts, seven donuts in each layer, topped with Emily's made-from-scratch roll icing. Garnished at the top with three additional cake donuts. This is a total of 31 donuts. 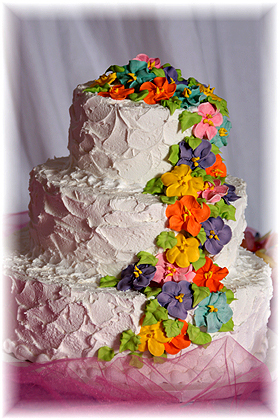 Icing colors can be changed, as well as the design and type of cake donuts. 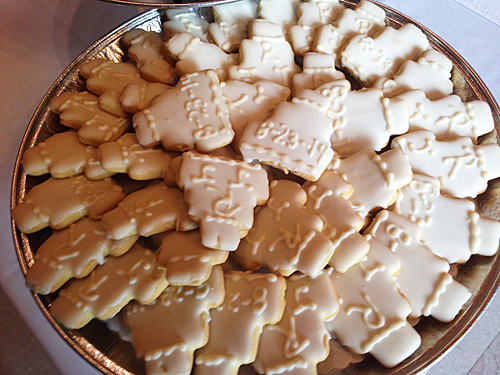 The photos above depict only a small sample of wedding cake options available at Emily's. 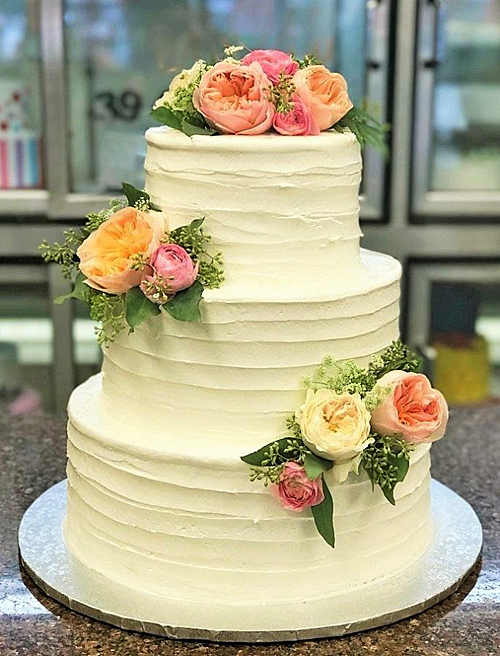 To view numerous additional design options, stop at our store in the Midtown Shopping Center and check out our wedding cake book. You'll be impressed.